Yes, yes, the rains have arrived – finally! That’s the good news. The bad news is that the rains came on the wings of some quite remarkable storms; we’re just through the second wave of winds with gusts of over 72 miles per hour and two more storm waves are expected until Friday of this week. 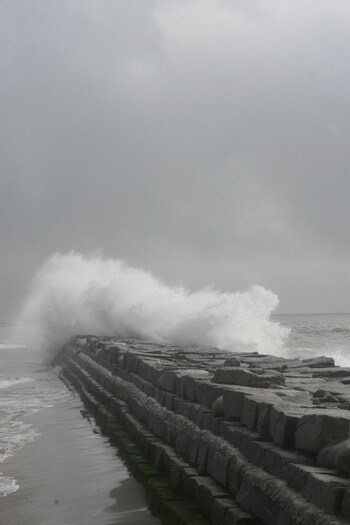 Down at the coast jetties and piers are closed, a sensible precaution in the face of 15-foot waves. There was some flooding of streets, an urban and small stream flood advisory plus a coastal flood watch is out. So, you guys are okay? I’ve been keeping up with the storms there, and it seemed most of the worst of it was north of you. I’ve read that the beaches are horribly littered with runoff from the flooding rivers. It must have been scary. 72 MPH winds are almost hurricane strength. Yow. Oh, we are fine. Even though we live near enough to the coast to get the cooler weather in summer, we are far enough away not to get caught in the brunt of the storms. The rains stopped Saturday and we are having the most glorious weather right now – sun, blue skies, everything is green, green, green and the mountains in the distance are covered with snow. There might be some more rain this coming week, but on a slightly lesser scale. I don’t mind – each and every drop helps and the higher the snow pack in the North, the better for all of California in the summer.